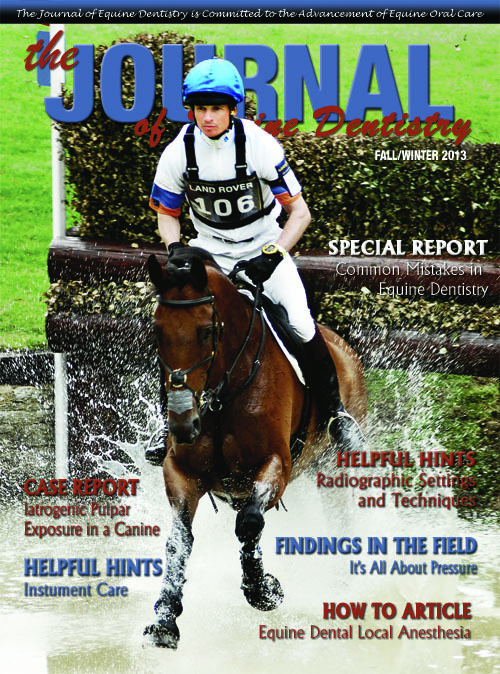 The Journal of Equine Dentistry celebrates 15 years of publication. As the only print publication strictly dedicated to equine dentistry, a continued concentration on research-based education is of great importance. With your support and contribution we, as The Journal staff, will aid in the focus of this direction. Research improves the foundation of knowledge and results in a strengthened educational system. The Journal will act as the core voice to this educational system by publishing pertinent, informative and correct articles. These articles will inform our readers of the latest research, both at The Academy of Equine Dentistry and in the field. We strive for The Journal of Equine Dentistry to be recognized as a forum where all interested parties can share experiences, methods and knowledge. What benefits will result from total involvement by the equine dentist community in the way of research? Research is the only objective method available to assess the viability of our theories and techniques. Individual involvement stimulates self-improvement as a practitioner. Research raises the level of available education and increases the knowledge base for equine dentistry. Reporting and documenting clinical cases stimulates awareness and suggests new avenues for further research direction. Involvement of all current professionals encourages the need for continuing education and increases enlightenment for future studies. Research leads to changes in method and technique, and promotes development of improved instrumentation. Exemplifying our practices through research provides credibility for the industry. Uniting dental practitioners, through a common goal, creates a network between colleagues for exchange of ideas. The benefits of education are not exemplified by short-term goals, but rather through a continuous process. One of the greatest gifts we can give the horse is to improve ourselves by participating in the educational process and by working together to provide the best possible care for the horse. Whether you are a horse owner, an equine dental practitioner or a veterinarian, you will find valuable information pertaining to the equine dental industry in The Journal. We cover a wide variety of information about equine dental case histories, theories, the latest in dental instrumentation and the newest techniques in treatment. The equine dental industry is expanding, and as a result, there are changes in instrumentation and practicing procedures. It is important current information is accessible to all who care about the welfare of the horse. We will make every effort to be the best source of information in this industry, and believe it is important to have input worldwide. As we proceed in this endeavor, thanks go to all dedicated individuals who continue to contribute essential information and help us to reach our goal. Please join us in another yearlong effort to better the lives of horses everywhere.